Closes March 25, 2017 @ www.Memorabilia.Expert. 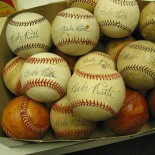 BidAMI Auctions -This item originates from famous collector Dr. Lonnie Hammargren. Hammargren is a longtime Las Vegas resident since 1969. He was the Lt. Governor of Nevada from 1995-99 and was a candidate for Governor of Nevada in 1998. His eastside home was featured three times on Robin Leach’s: Lifestyles of the Rich and Famous. It was also featured on the Travel Channel’s show Vegas VIP Homes and a HGTV show, What’s With That House? It has since become a museum to Las Vegas past. It is usually open for tours on Nevada Day with 8000 attending the Centennial Celebration in 2005. Nowadays Elton John, Lady Gaga and Madonna dominate the world stage with their over-the-top costumes and artistic performances. Before them came Liberace. He was a charismatic showman who at one time was the world’s highest paid entertainer. He earned as much as $300k a week with 40k fan letters a month at one point. He was the glitz and flash of Las Vegas personified. Wow-factor diamonds and flashy clothes were his trademark on and off the stage. However, it is not an ordinary piano because it was embellished with Liberace’s style. A central “Liberace” logo in red accents the piano along with blingtastic rhinestones decorated throughout. The back features the designer’s name Anna Nateece embroidered on cloth. Nateece was Liberace’s costume designer and close friend for the balance of his career. She often refers to Liberace as “Lee,” as do most of those who either knew or admired the great Las Vegas showman. The piano is well aged and presumably needs some love in order to play sweetly as it once did under the tickling of Liberace. View the entire video and you will hear how this beauty sounds! Librace autographed it and drew a piano on it with the date 1978. There’s also a photo of him standing next to it for added provenance. This was obtained directly from the Liberace Estate in Las Vegas. This is a piano, according to its history, was stage used, played and adored by the Piano master himself. It has been well preserved for decades. Owning anything of Liberace is now getting more scarce as time evolves. Michael Douglas’ portrayal of the epic showman, gives us an insight to his talent, extreme love of the stage and music. A truly historic piece in the world of entertainment. Please note this is a heavy instrument and a shipping surcharge will surely apply. This entry was posted on March 17, 2017 by Memorabilia.Expert BidAMI in Authentication Tips, Marketplace Catagories.